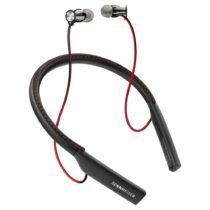 The Sennheiser HD1 in-ear wireless headphones have an ergonomic design that makes it comfortable and easy to wear. Made from high-quality materials, the Sennheiser HD1 in-ear wireless provides excellent wireless hi-fi sound thanks to the Bluetooth 4.1 technology it is equipped with. It has long battery life and built-in microphone. The headphones also come with an instruction manual, 4 sets of rubber tips and a charging cable. 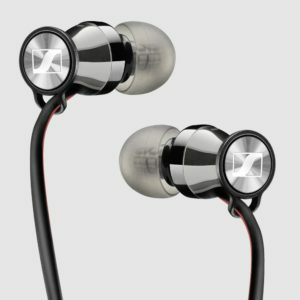 Read this Sennheiser HD1 in-ear wireless review and learn what this headphone can offer. The Sennheiser HD1 in-ear wireless offers a warm audio performance that makes it enjoyable and comfortable to use for long listening sessions. It shines best in the low end and midrange registers. From jazz to hip-hop, everything sounds sharp and dynamic on the HD1 in-ear wireless headphones. The sound it delivers is not just dynamically strong, but also rich in detail. It can scale lows and highs with ease. 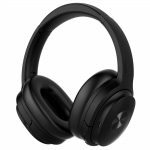 The headphone provides a sculpted sound signature with a lot of added bass depth that is balanced by highly sculpted highs and high-mids. The exceptional passive noise isolation also improves the sound signature’s overall appeal. If you are looking for a headphone that delivers a solid audio performance, you should definitely consider the Sennheiser HD1 in-ear wireless. 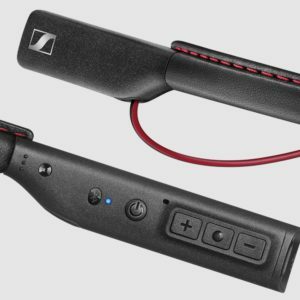 The Sennheiser HD1 can last up to 10 hours. It also features a fast-charging technology that replenishes the battery’s power in 1 ½ hour. The headphones are easy to set up as well. You can pair Android phones to the Sennheiser HD1 in-ear wireless in 2 ways – press and hold the power button until the status LED flickers blue and red or choose the headphones in the Bluetooth menu of your device. For iOS users, the latter is the only way to pair their device to the headphones. 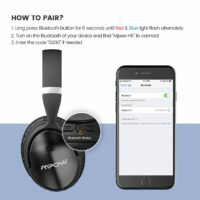 If your device is NFC-supported, you can hold your device to the headphone’s outer right side and hold the power button until the status LED flickers blue and red. The black sheepskin nappa leather neckband has gorgeous red stitching. The ends of the band are also enclosed in matte black plastic. 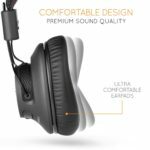 Inside the glossy chrome earpieces are dynamic drivers that provide a frequency range of 15Hz to 22kHz. The neckband has extra features as well. The Sennheiser HD1 in-ear wireless vibrates when you get a phone call on the paired device. It also vibrates when you turn the headphone off or on or pair it with a device. Since the neckband is NFC-enabled, you can pair the headphone with compatible devices by just tapping it. It’s also possible to connect two devices at the same time. This means that you can listen to audio on one and receive calls from another. The controls located on the left side of the neckband are the power button, central multifunction button, volume control keys, and status LED that indicates power and pairing status. The microphone is also located on the neckband. You can control volume through the plus/minus buttons. Holding the buttons for 2 seconds allow you to navigate tracks. The central button manages incoming calls and controls playback. This button mutes the mic when tapped twice. There is also a micro USB charging port on the left side of the neckband. The multifunction button lets you pause or play songs. The right side of the headphone doesn’t have any input or button. The earphones are fastened at the end of each side, located behind the control button. This means that you will not accidentally rip the earphones out of your ears when reaching for the volume. The tight fit of the Sennheiser HD1 in-ear wireless also offers excellent passive noise isolation. The band is quite bulky. Not everyone is fond of neckband-style earphones, especially those who wear a lot of scarves or hoodies. However, the Sennheiser HD1 in-ear wireless has a comfortable and luxurious design, so your ears won’t hurt even after long listening sessions. 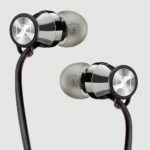 The Sennheiser HD1 in-ear wireless is a good option for bass lovers. 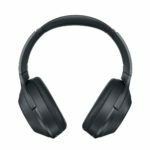 It delivers a strong audio performance with clear highs and rich bass. 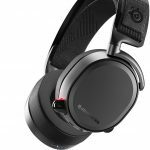 The headphones also come with a black zip-up case with the same red-stitching found on the neckband, so you can store it safely when not in use. 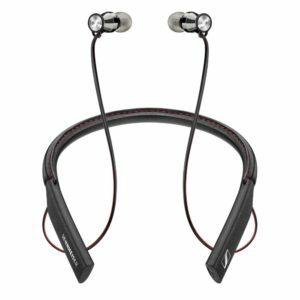 If you don’t mind the neckband design, the Sennheiser HD1 in-ear wireless headphones worth checking out.